It may seem like the kids just got out of school, but before you know it they will be heading back! This is the perfect time to work on some quick and easy back to school craft ideas. 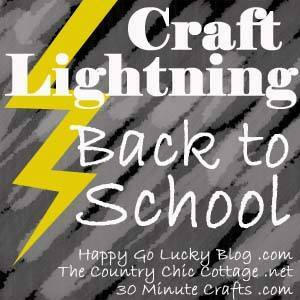 I am excited to be participating in my first Craft Lightning Week Hosted by The Country Chic Cottage, 30 Minute Crafts and Happy Go Lucky. 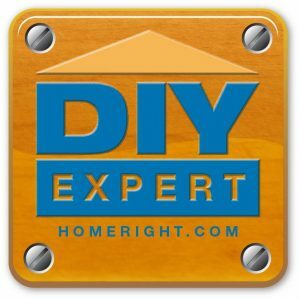 This is a fun idea where you share crafts that can be whipped up in 15 minutes or less. The theme is back to school. Fun right? Journaling is something that so many people enjoy. But even if they don’t journal, these can be used as a lesson planner or even just to keep important names and numbers in. My daughter even used several of these decorated with paper of her choosing as notebooks while she was in high school. 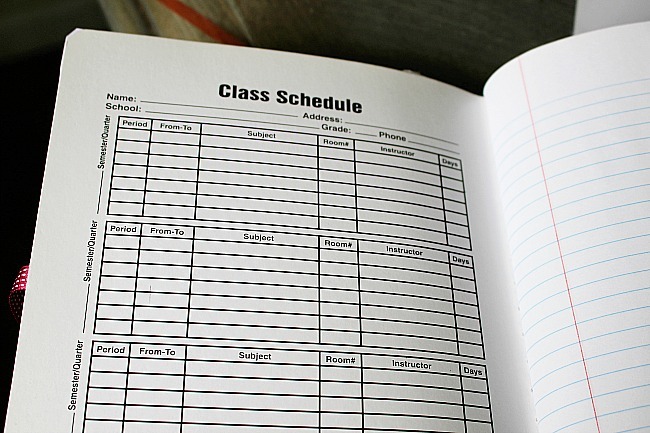 Who needs a boring old notebook when you can have a pretty decorative notebook right? Actually I think my daughter just humored me half the time! Part of growing up with a crafty Mom! I don’t really measure anything. It is easier for me to just line the paper up with the notebook and mark where I want to cut it. I use a paper cutter to ensure it is perfectly even. Cut a piece to cover the front and back of the notebook. You can use it coordinating paper for the back if you’d like. 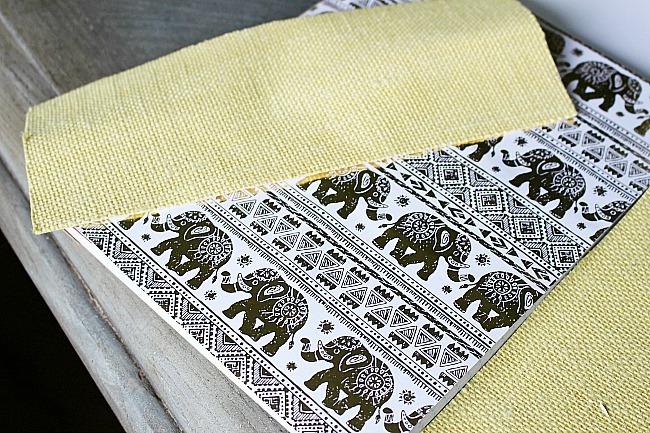 Then cut a piece of heavy texture paper-like this burlap paper-to act as a binder for the journal. I find this is the part of the journal that gets the most beat up so if you use a heavy paper it lasts longer. I would not recommend the light scrapbook paper as it will rip easily. 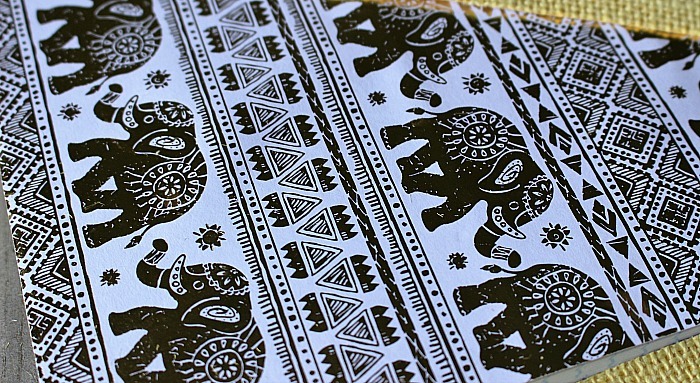 Isn’t this elephant paper so pretty? 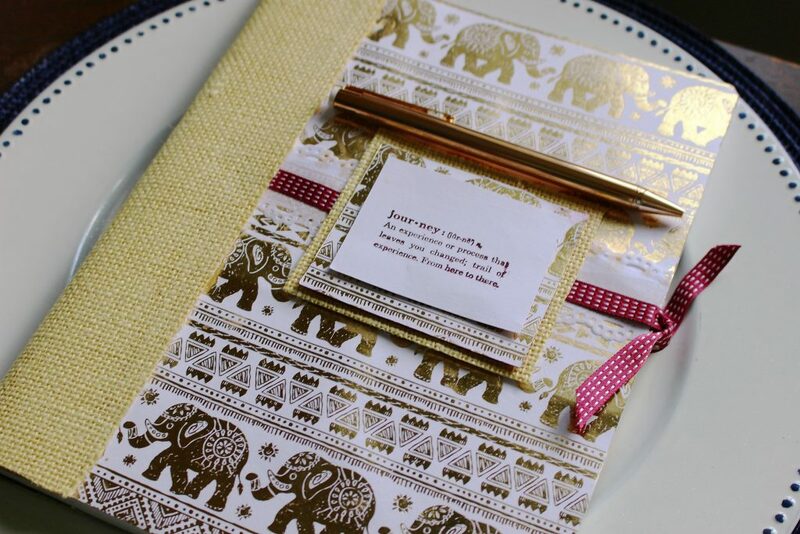 Elephant’s are known to bring good luck if the trunks are up and I thought this was perfect to add a little note saying “Best of luck for a great new year!” Then it’s just a matter of using Mod Podge to attach the paper to the journal. You can leave it at that or add a stamped saying and ribbon to the front as I did. It is totally up to you. I layered 3 square pieces of paper to the front of the journal using dimensionals to raise the paper. 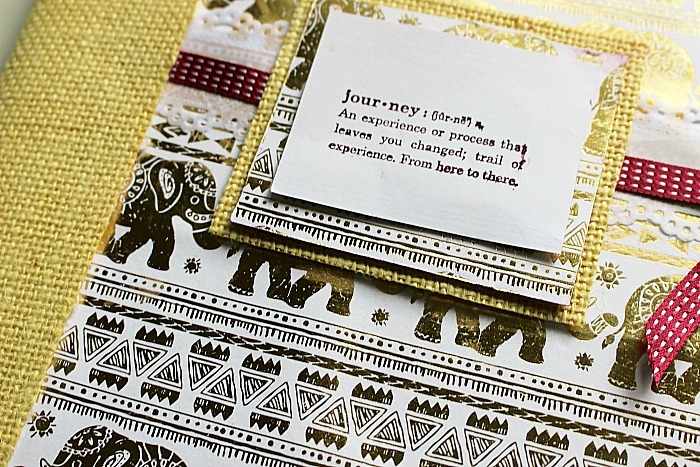 I then stamped a saying that I thought was perfect called “journey: an experience or process that leaves you changed; trail of experience. From here to there. Hopefully it will be a good experience! 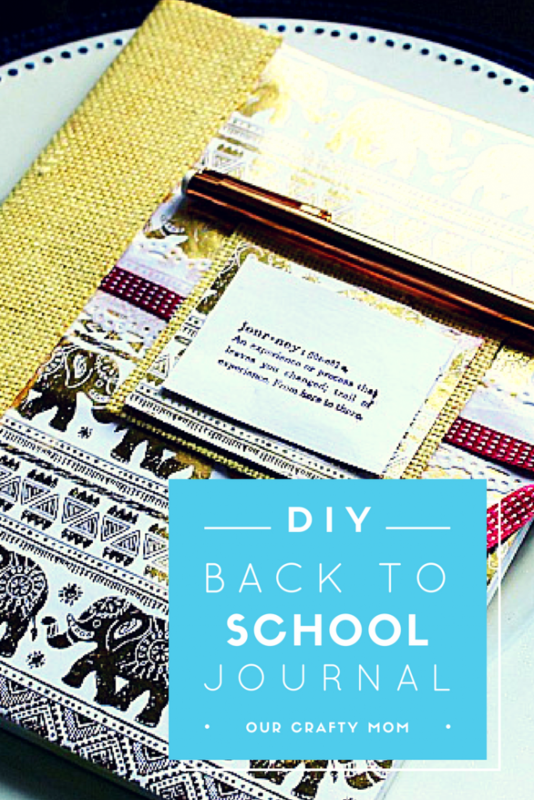 I hope you enjoyed this easy Back to School Teacher Gift Idea~DIY Journal. 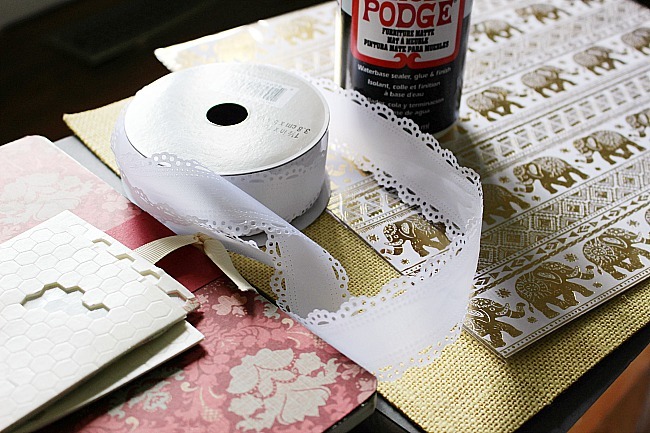 It doesn’t cost a lot or take a lot of time to craft a beautiful, thoughtful gift. The gold pen I found at The Dollar Tree totally completes this gift. 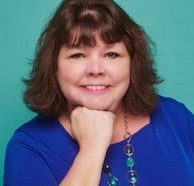 I would love it if you would subscribe to my email so you never miss a post. Have a great day! My daughter would love this! Thanks for joining! You always have the best ideas. I love this and it would make a great gift for a teacher. Thanks so much Sherry! Have a great day! I love it! It is so pretty!! Thanks so much Carolina! 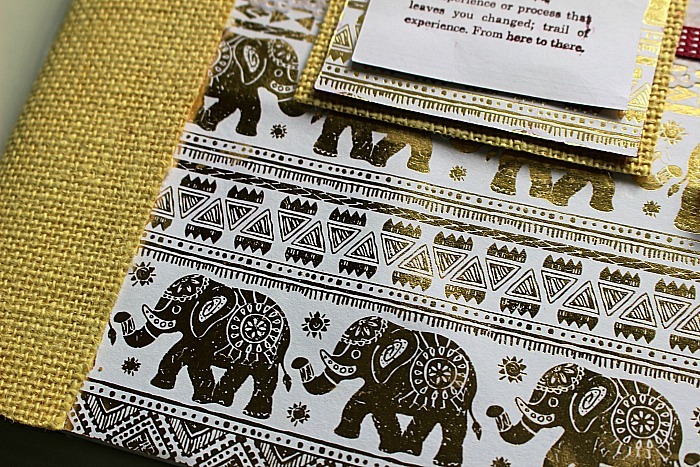 I love the elephant paper! Have a good day! What a fabulous idea!! There’s going to be some very happy teachers when the kiddies head back to school!